But here's a work in progress to look at. yes, it is quiet.. but that is ok with me as I am very busy at work. A new version of RFC4D should arrive at the end of the week, so there might be more questions regarding this soft. Simple Realflow construction, but a lot of node timing and polygon size control issues. Nothing extraordinary. Can you tell me how did you create the white foam above the yeallow water ? This one was easy: no special Phython coding or use of Filter Daemons to pass the champagne particles to foam particles. There are two domains - one for champagne and one for foam. The "Foam" is simply the result of a second DY_Domain with its own collection of emitters at the tops of the coupes for the first three layers of coupes ("glasses"). The emitters are pouring out foam particles relatively slowly and have a horizontal random value setting, among other things. The only tricky things about this scene were management of a two complex sets of emitters, timing of all of this, "noise" settings and the like. Subtle settings for two sets of meshers (one for champagne and one for foam) was important - takes the burden off the renderer and avoid the need for exotic shader settings. Can I help you with something like this? 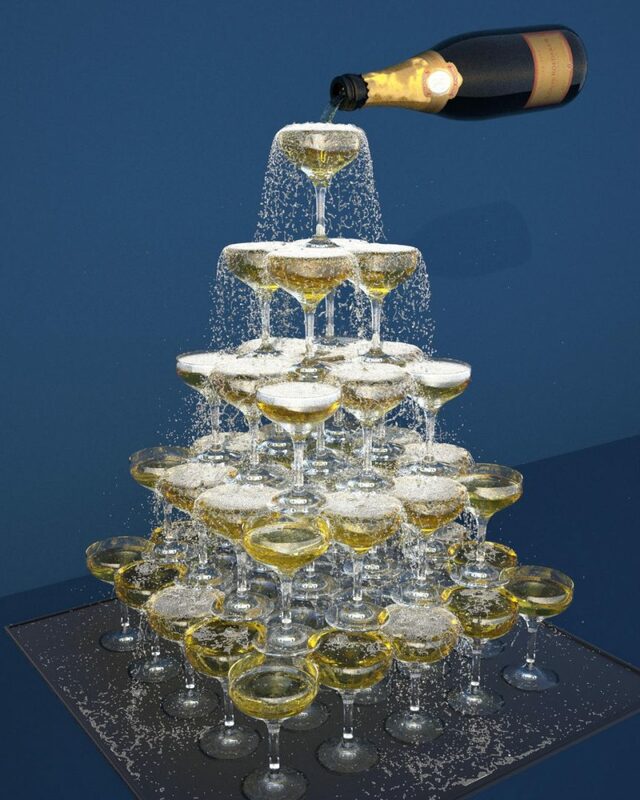 David_VFX, I'm currently working on two Pouring Champagne model sets (plus the Realflow sims, of course). One pouring into a coupe-type glass and the other pouring into a flute-type glass. The close-up versions are much more difficult because of the fine details of the champagne liquid and the foam. In trials with real champagne pours, the foam behaves much differently in the flute glass than in the coupe glass. If you are working on any of these, you should be aware of these differences. And these types of pours do need to make use of either Python scripting or fairly sophisticated use of the Filter Deamon(s). Just so you know. Yes, I use Filte deamon but the Foam auto sink to the bottom of the cup, not float. It's really anoying. I see that people make this very easy with Phoenixfd plugin for MAX and Maya, but Idon't want to jump to other big Software. David, you must decrease the Density value in the Foam's Domain settings to cause the foam particles to float above the liquid particles. I tend to use Density values of approximately "400" for foam, when a conventional liquid has a Density value of around "1000." Other people use values of around 200 or even just 100. And, of course, "foam particles" will take a few sim steps to start working their way to the top of the liquid. There are various tutorials about Realflow Foam on the web. Dealing with "foam" is actually fairly easy unless you are making an exceedingly complex scene. You can move to another software if you wish, and maybe find it easier to use. But, no particle simulation program can be mastered in just a few days or a few weeks. I am a long-time Maya user. I'm conversant with BiFrost in Maya, and with Houdini. I find Realflow to be superior to those for very high resolution projects involving mid-size and small liquids. Its also easier than Houdini because it is based on real-world particle physics, for the most part. So, it is easier to learn - just requires thinking about how various kinds of liquids behave in the real world. So, you need to consider that in the real world, "foam" is significantly less "dense" and weighs less than water. If you think like this, you figure out that maybe you need to adjust the density value of the "foam domain" so that those particles become less dense than the water particles. If reducing the density value alone does not start your foam particles moving toward the top of the liquid, over some ten or twenty sim steps, then you should think about which forces continue to drive those particles downward. And then think about ways to counteract those forces. You can use "cheats" to accelerate the upward movement of those particles. Such as putting a Gravity Daemon on the Foam Domain (exclusive to the Foam Domain, not applied to the Hub), and then giving the Gravity Daemon a negative value so that "gravity" moves the foam particles upward. You can use "cheats" like this, but it is better to reserve them for cases when everything else fails. Instead, it is better to think about how these things work in the real world, and try to create those kinds of conditions within Realflow. If I understand correctly, you are relatively new to Realflow, yes? If so, I might suggest some tutorials for you. Let me know.